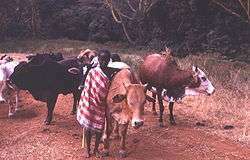 Nomadic pastoralism is a form of pastoralism when livestock are herded in order to find fresh pastures on which to graze. Strictly speaking, true nomads follow an irregular pattern of movement, in contrast with transhumance where seasonal pastures are fixed. However this distinction is often not observed and the term nomad used for both—in historical cases the regularity of movements is often unknown in any case. The herded livestock include cattle, yaks, sheep, goats, reindeer, horses, donkeys or camels, or mixtures of species. Nomadic pastoralism is commonly practised in regions with little arable land, typically in the developing world, especially in the steppe lands north of the agricultural zone of Eurasia. Of the estimated 30–40 million nomadic pastoralists worldwide, most are found in central Asia and the Sahel region of West Africa. 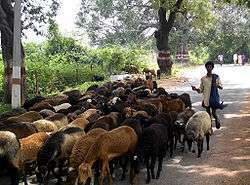 Increasing numbers of stock may lead to overgrazing of the area and desertification if lands are not allowed to fully recover between one grazing period and the next. Increased enclosure and fencing of land has reduced the amount of land available for this practice. The nomadic pastoralism was a result of the Neolithic revolution. During the revolution, humans began domesticating animals and plants for food and started forming cities. Nomadism generally has existed in symbiosis with such settled cultures trading animal products (meat, hides, wool, cheeses and other animal products) for manufactured items not produced by the nomadic herders. Henri Fleisch tentatively suggested the Shepherd Neolithic industry of Lebanon may date to the Epipaleolithic and that it may have been used by one of the first cultures of nomadic shepherds in the Beqaa valley. Andrew Sherratt demonstrates that "early farming populations used livestock mainly for meat, and that other applications were explored as agriculturalists adapted to new conditions, especially in the semi‐arid zone." A young Maasai cattle herder in Kenya. In the past it was asserted that pastoral nomads left no presence archaeologically but this has now been challenged, and was clearly not so for many ancient Eurasian nomads, who have left very rich kurgan burial sites. Pastoral nomadic sites are identified based on their location outside the zone of agriculture, the absence of grains or grain-processing equipment, limited and characteristic architecture, a predominance of sheep and goat bones, and by ethnographic analogy to modern pastoral nomadic peoples Juris Zahrins has proposed that pastoral nomadism began as a cultural lifestyle in the wake of the 6200 BC climatic crisis when Harifian pottery making hunter-gatherers in the Sinai fused with Pre-Pottery Neolithic B agriculturalists to produce the Munhata culture, a nomadic lifestyle based on animal domestication, developing into the Yarmoukian and thence into a circum-Arabian nomadic pastoral complex, and spreading Proto-Semitic languages. Winter (from December to the end of March) — desert plains. The movements in this example are about 180 to 200 km. Camps are established in the same place each year; often semi-permanent shelters are built in at least one place on this migration route. In the rainy season, the groups live in a village intended for a comfortable stay. The villages are often made of sturdy material as clay. Old men and women remain in this village when the other people move the herds in the dry season. In the dry season, the people move their herds to southern villages with a more temporary character. They then move inland, where they stay in tent camps. In Chad, the sturdy villages are called hillé, the less sturdy villages are called dankhout and the tents ferik. 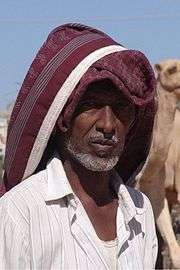 A camel trader in Hargeisa, Somalia. Nomadic pastoralism was historically widespread throughout less fertile regions of Earth. It is found in areas of low rainfall such as the Arabian Peninsula inhabited by Bedouins, as well as Northeast Africa inhabited by Somalis (where camel, sheep and goat nomadic pastoralism is especially common). Nomadic transhumance is also common in areas of harsh climate, such as Northern Europe and Russia inhabited by the indigenous Sami people, Nenets people and Chukchis. 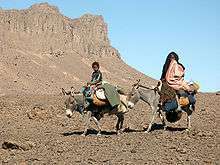 There are an estimated 30-40 million nomads in the world. Pastoral nomads and semi-nomadic pastoralists form a significant but declining minority in such countries as Saudi Arabia (probably less than 3%), Iran (4%), and Afghanistan (at most 10%). They comprise less than 2% of the population in the countries of North Africa except Libya and Mauritania. The Eurasian steppe has been largely populated by nomads since early prehistoric times, with a succession of peoples known by the names given to them by surrounding literate societies, including the Scythians, Saka and Yuezhi. The Mongols in what is now Mongolia, Russia and China, and the Tatars or Turkic people of Eastern Europe and Central Asia were nomadic people who practiced nomadic transhumance on harsh Asian steppes. Some remnants of these populations are nomadic to this day. In Mongolia, about 40% of the population continues to live a traditional nomadic lifestyle. In the Middle Hills and Himalaya of Nepal, people living above about 2,000 m practise transhumance and nomadic pastoralism because settled agriculture becomes less productive due to steep slopes, cooler temperatures and limited irrigation possibilities. Distances between summer and winter pasture may be short, for example in the vicinity of Pokhara where a valley at about 800 meters elevation is less than 20 km. from alpine pastures just below the Annapurna Himalaya, or distances may be 100 km or more. For example, in Rapti zone some 100 km west of Pokhara the Kham Magar move their herds between winter pastures just north of India and summer pastures on the southern slopes of Dhaulagiri Himalaya. In far western Nepal, ethnic Tibetans living in Dolpo and other valleys north among the high Himalaya moved their herds north to winter on the plains of the upper Brahmaputra basin in Tibet proper, until this practice was prohibited after China took over Tibet in 1950-51. The nomadic Sami people, an indigenous people of northern Finland, Sweden, Norway, and the Kola Peninsula of Russia, practise a form of nomadic transhumance based on reindeer. 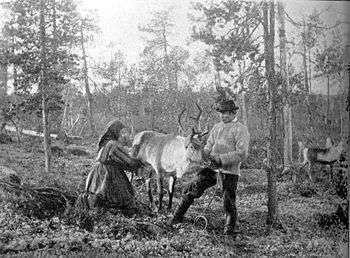 In the 14th and 15th century, when reindeer population was sufficiently reduced that Sami could not subsist on hunting alone, some Sami, organized along family lines, became reindeer herders. Each family has traditional territories on which they herd, arriving at roughly the same time each season. Only a small fraction of Sami have subsisted on reindeer herding over the past century; as the most colorful part of the population, they are well known. But as elsewhere in Europe, transhumance is dying out. The Mesta was an association of sheep owners, (Spanish nobility and religious orders) that had an important economic and political role in medieval Castile. To preserve the rights of way of its transhumant herds through cañadas, the Mesta acted against small peasants. In Chad, nomadic pastoralists include the Zaghawa, Kreda, and Mimi. Farther north in Egypt and western Libya, the Bedouins also practice pastoralism. Sometimes nomadic pastoralists move their herds across international borders in search of new grazing terrain or for trade. This cross-border activity can occasionally lead to tensions with national governments as this activity is often informal and beyond their control and regulation. In East Africa, for example, over 95% of cross-border trade is through unofficial channels and the unofficial trade of live cattle, camels, sheep and goats from Ethiopia sold to Somalia, Kenya and Djibouti generates an estimated total value of between US$250 and US$300 million annually (100 times more than the official figure). This trade helps lower food prices, increase food security, relieve border tensions and promote regional integration. However, there are also risks as the unregulated and undocumented nature of this trade runs risks, such as allowing disease to spread more easily across national borders. Furthermore, governments are unhappy with lost tax revenue and foreign exchange revenues. There have been initiatives seeking to promote cross-border trade and also document it, in order to both stimulate regional growth and food security, but also to allow the effective vaccination of livestock. Initiatives include Regional Resilience Enhancement Against Drought (RREAD), the Enhanced Livelihoods in Mandera Triangle/Enhanced Livelihoods in Southern Ethiopia (ELMT/ELSE) as part of the Regional Enhanced Livelihoods in Pastoral Areas (RELPA) programme in East Africa, and the Regional Livelihoods Advocacy Project (REGLAP) funded by the European Commission Humanitarian Aid Office (ECHO). ↑ Blench, Roger (2001). Pastoralists in the new millennium (PDF). FAO. pp. 11–12. ↑ L. Copeland; P. Wescombe (1966). Inventory of Stone-Age Sites in Lebanon: North, South and East-Central Lebanon, p. 49. Impr. Catholique. Retrieved 29 August 2011. ↑ Fleisch, Henri., Notes de Préhistoire Libanaise : 1) Ard es Saoude. 2) La Bekaa Nord. 3) Un polissoir en plein air. BSPF, vol. 63, 1966. ↑ Cribb, R (1991) Nomads in Archaeology. Cambridge University Press. Cambridge. ↑ Oriental Institute of Chicago "Nomads, Tribes, and the State in the Ancient Near East: Cross-Disciplinary Perspectives". ↑ Zarins, Juris (1992) "Pastoral Nomadism in Arabia: Ethnoarchaeology and the Archaeological Record," in O. Bar-Yosef and A. Khazanov, eds. "Pastoralism in the Levant"
↑ Lewis, I.M. (1999). A Pastoral Democracy. LIT Verlag Münster. p. 31. ISBN 3825830845. ↑ Mongolia Today - online magazine Archived January 22, 2009, at the Wayback Machine.